Chances are you don’t. That’s okay; it’s not exactly that famous. But if you do, you are to be congratulated for identifying the earliest surviving complete piece of written music, generally called “Hurrian Hymn no. 6”. More or less complete, at least – it’s broken in half, and one of the halves is crumbling (fired clay tablets don’t exactly react well to water). It’s not surprising that it’s in such bad shape: it’s about 3200 years old. It was found in the ruins of the city of Ugarit, near the modern town of Ras Shamra (Cape Fennel), Syria. Although the tablet has seen better days, enough of the cuneiform signs written on it can be read to allow a rough transcription into the Latin alphabet. Two transcriptions were made from the original in the 1960s; some of the surface of the damaged half of the tablet has since flaked off. 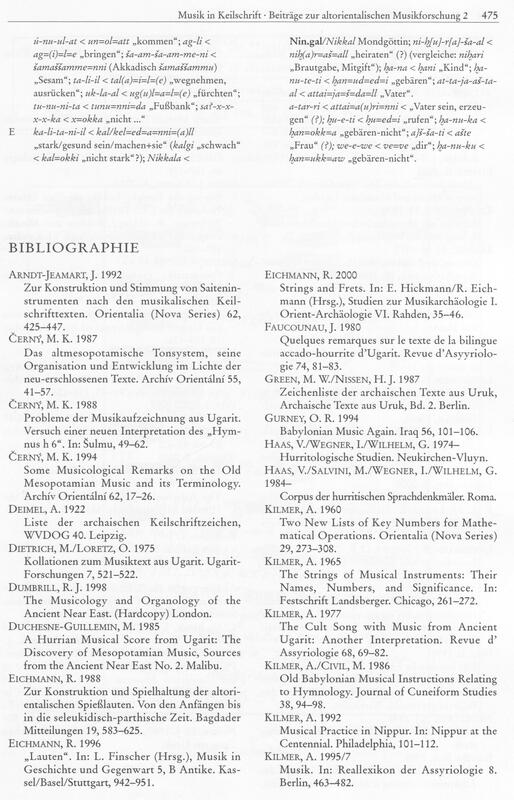 The first transcription by E. Laroche, provides the groundwork for Kilmer and Marcelle-Guillemin’s versions. The second, a (relatively) more recent one by M. Dietrich and O. Loretz based on 1960s photographs of the tablet taken from several angles, is more complete, and is used in the versions by Thiel and Krispijn. Unfortunately, when it comes to the meaning of the lyrics and the reading of the music, consensus is hard to find. wandanita = “to the right”. išalla = from išaš “me”. ḫana, ḫanuteti, ḫanuka, ḫanuku = from ḫan- "give birth"
(Wenn die Sündhaftigkeiten) nicht (mehr) ‘verdeckt’4 (sind) und wenn nicht (mehr) ‘geändert’ werden muss, befinde ich mich wohl, fertig geopfert habend. ich mich fürchtend (,) möge … -en5 (,) nicht … -end. möge …-en6 (,) wird nehmen (die noch) nicht Geboren habende7. 1 ‘Blei’ in der Eigentschaft einer (rituell) verwendeten Reinigungs-Substanz. 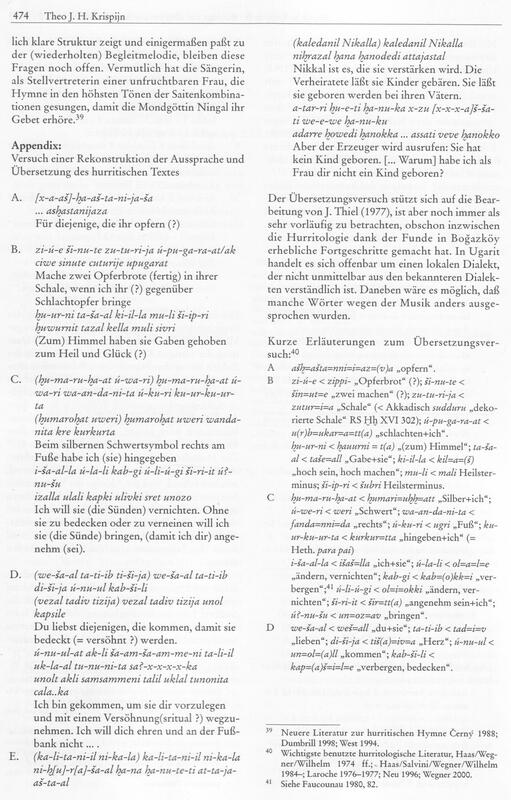 2 Wohl ein Verb der Bedeutung des rituellen Reinigens bzw. Segnens. 3 ‘ändern’, i.e. magisch-rituell ‘lösen’. 4 ‘Nicht-Verdecktes’ mit dem Gegensatz ‘verdeckt’ in Zusammenhang mit einer (religiösen) sündhaften Verfehlung. 6 Oder ein Nomen (‘Kind’?). 8 Oder ‘(das noch) Ungeborene’. Also wohl entweder ‘(die noch) Nicht-Geboren-Habende wird (ein Kind) …’ oder ‘(der Vater) wird das (noch) Ungeborene nehmen’. The third translation, by Theo J. H. Krispijn, was published much more recently, in 2000. Krispijn bases his version on Thiel’s translation, but points out that the extensive material published about Hurrian since 1977 has “substantially” increased our understanding of the language. While this article is in German, a more recent article from 2008 gives his translation in English. I’ll give you the best of both worlds: the Hurrian transcription of the 2000 article and the English translation of the 2008 article. (Just as a side note, the Hurrian transcription reads more or less like English in terms of the sounds of the letters, and “ḫ” is pronounced like the German “Bach”. I’ve replaced Krispijn’s “v”, “w” and “c” with with their English phonetic equivalents “f”, “v” and “ts”. “x”, as always, stands for an illegible or broken part of the tablet, not for the “ks” sound). prepare two offering loaves in their bowls, when I am making a sacrifice in front of it. They have lifted sacrifices up to heaven for (their) welfare and fortune (?). At the silver sword symbol at the right side (of your throne) I have offered them. I will nullify them (the sins). Without covering or denying them (the sins), I will bring them (to you), in order to be agreeable (to you). You love those who come in order to be covered (reconciled). It is Nikkal, who will strengthen them. She let the married couples have children. She let them be borne to their fathers. But the begetter will cry out: "She has not born any child!" Why have not I as a (true) wife born children for you?" WARNING: THE FOLLOWING SECTION CONTAINS MUSICAL TECHNOBABBLE. IF YOU’RE HERE FOR THE MUSIC, SKIP THIS SECTION – BUT AT YOUR OWN PERIL. Notice how the music is written in words followed by numbers. Unfortunately for modern researchers, this notation system is completely unlike modern musical notation. Firstly, staff notation would not be invented for over two millennia; so right off the bat, we’re denied one of the most useful reference points for figuring exact pitches. The same problem exists in the 60-or-so surviving fragments of ancient Greek music; to resolve this, and to allow relatively authentic reproductions of the music, a decision was made by F. Bellermann in 1840 about which symbol would match which pitch, based on replicas made of ancient Greek instruments. This has since been found to be off from the actual tuning by around a minor 3rd (Pöhlmann, Egert & West, Martin L. Documents of Ancient Greek Music. Oxford: Clarendon Press. 2001. It’s a good book, and contains all Ancient Greek music known to date). A similar general consensus has been agreed upon for Mesopotamian music like the Hurrian Hymn. Of course, in both the Ancient Greek and Mesopotamian cases, exact tuning varied from location to location, since there was no international or even interregional standard. In addition to pitch, the tuning and mode of a specific piece are just as important: the opening movement of Beethoven’s 5th wouldn’t have quite the same vehemence if it was in major (a.k.a the Ionian mode). On the Hymn tablet, the expression “ni-id qib-li” in the last line refers to the mode. This matches the nid qabli mode described in Babylonian musical documents. The fact that “ni-id qib-li” and “nid qabli” don’t perfectly match isn’t an issue: in fact, all terms but one in the notational half of the tablet are corruptions of musical terms used in the native Akkadian language of the region of Babylon. Here, however, a problem arises: which modern mode matches “nid qabli”? To answer that, you need to know a little bit of background. You see, the Mesopotamian music system is based around the harp or lyre (a portable harp, usually about the size of a laptop). The 9 strings of the instrument were like modern harps in that each string was one step up or down in the scale from the string beside it. The scales used by the Mesopotamians had seven notes, just like modern Western music (A B C D E F G). So, when there was a piece in what we nowadays would call a “major key”, the harpist would have to tune his strings to, say, C-D-E-F-G-A-B-C-D.
You see that’s in C minor. Now, if you tuned your strings to C-D-E-F-G-A-B-C-D, you’ll run into trouble almost immediately: the string is tuned to E-natural, but you have to play an E-flat! Now what do you do? Well, you have to re-tune the instrument to the key of C minor. That’s exactly what the Mesopotamians did, and each different tuning had its own name. Now we get to the problem: which modern mode matches “nid qabli”? That is, if you start playing in this tuning on the first string and work your way up to the seventh string, what’s the modern name of the mode that you hear? In order to answer that, you need to know if you’re going up or down the scale – that is, is string 2 lower or higher in pitch than string 1? Not a single Mesopotamian document gives the answer, so scholars have tried to find out indirectly, based on the phrasing and ordering of tablets about tuning and music theory. So far, their opinions differ. In general, most resources consider string 2 to be higher in pitch than string 1, so by playing the strings 1-2-3- and so on, you’d get a rising scale. However, several scholars, including Raoul Vitate, Martin West and Theo Krispijn, raise an objection to this: based on images of people playing harps and lyres from various Mesopotamian sites, as well as analyzing the meaning of the names of certain strings, they concluded that the strings descended in pitch with their number, i.e. string 2 would be lower in pitch than string 1. So we know the name of the right tuning, but we don’t know what it means. Great. It gets worse. Unlike what is done today with melodies, where each note is assigned one specific pitch (e.g. A), the system used by Hurrian Hymn 6 (and the fragments of other hymns found at Ugarit) assigns each note a certain interval (e.g. “embube”, matching Akkadian “embubu”, i.e. strings 3 & 7). If this wasn’t confusing enough, a number occurs after each interval. This has caused no end of confusion. Does this mean that both pitches are sung simultaneously as many times as the number? (Remember the lyrics? This wasn’t just an instrumental piece, it was a song!) Does it mean to sing a scale from one pitch to the other, repeating certain pitches if the specified number is larger than the number of pitches in the interval? Or does it mean something completely different? This is where practically all hope of a definitive version breaks down. Aside from the fact that the majority (Kilmer, Černý, West, Krispijn, Monzo) use the “two simultaneous pitches” idea as the basis for their reconstructions, very little can be found in common between the resulting pieces. Part of the reason why some researchers (Wulstan, Duchesne-Guillemin, Vitale, Dumbrill) choose other interpretations is that applying the “simultaneous pitches” approach means that one of the oldest examples of written music is polyphonic, i.e. has more than one voice. Now, it’s known that limited amounts of polyphony existed in ancient Greece, but even there examples of it are rare and poorly understood (by modern readers). The notion that the earliest recorded music may have been polyphonic seems almost inconceivable: people usually tend to sing the same melody at the same pitch, although men usually sing an octave below women. Polyphony is very complex: the earliest definite examples of a polyphonic tradition don’t appear until after the year 1000 A.D.! That’s over 2000 years after Hurrian Hymn no. 6 was written! If that isn’t reason enough, only the vast minority of human musical traditions are polyphonic. Not surprising, then, that researchers have been reluctant to accept its presence in Mesopotamia. END OF MUSICAL TECHNOBABBLE. FEEL FREE TO BREATHE A SIGH OF RELIEF. Now for the moment you’ve all been waiting for: the realizations! Each musical realization has something in its favour, and since so little is certain about Mesopotamian music theory, writing, performance – heck, Mesopotamian music in general –, it’s more or less up to personal preference which version one finds most convincing. In my case, I’m most familiar with the versions by Kilmer and West, and have heard CD recordings of both. While Kilmer’s version has the strength of a polyphonic realisation behind it, I prefer West’s version. Why? It sounds so simple and austere, with a seriousness that suits the lyrics. After all, this is a childless woman praying to a goddess to grant her offspring. That’s hardly light subject matter! In addition, there’s an old rule called “Occam’s Razor” that states “the simplest answer is usually the right one”.